I waffled most of the week on whether or not to take my Thursday lesson. 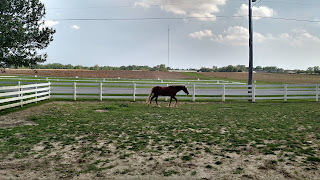 Connor is settling well into the new place on the ground, but under saddle he's been a lunatic all week. Screaming, tense, spooky, won't relax. 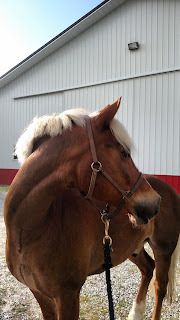 I even had to one rein stop him into the wall of the indoor on Tuesday after he took off (Cob version of "took off", anyway) when a horse being ridden by outside the indoor scared the daylights out of him. His OTTB friend, who can't live without him. Thankfully Connor likes him, but doesn't feel the same way. 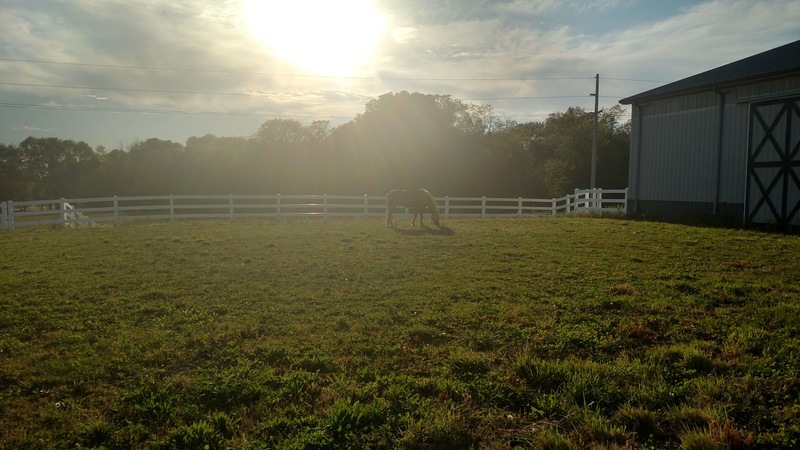 I know that I'm dealing with a "worrier" of a horse who just needs time to learn that nothing here, specifically while being ridden, is going to kill him. 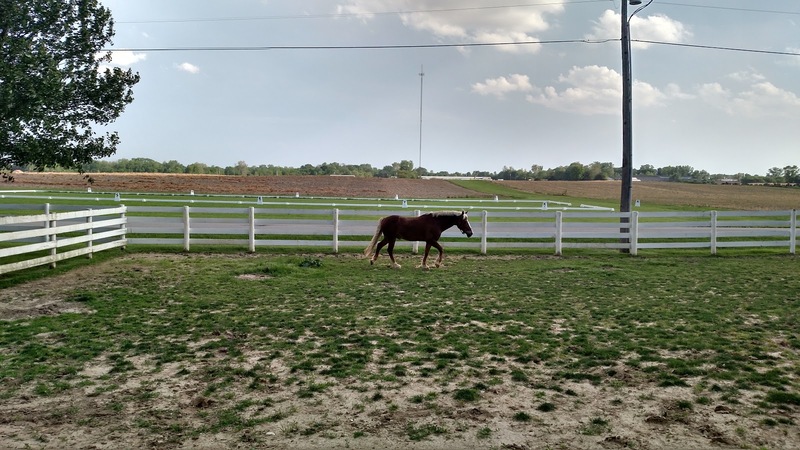 And I wondered if going "home" to my old barn so soon after moving would blow up his fledgling sense of normalcy at the new barn. 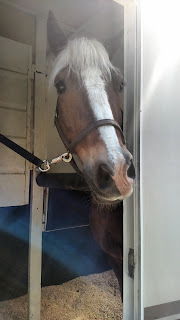 But, in the end, my trainer and I decided that we needed to get a good ride in SOMEWHERE, and since we're not going to get one at the new place, we should haul out. "...I have had the weirdest f****** week." I'm so glad I did. 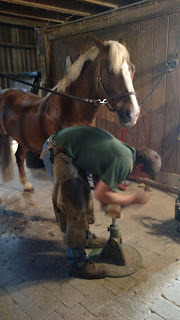 We ended up having a great lesson (that I will review once I have Pixio footage), but almost more importantly, I just happened to arrive super early, my farrier just happened to be out there (normally he's there on Mondays during the day) and just happened to have time to trim Connor before my lesson. My farrier describes trimming Connor as the "highlight of his day" because Connor is so easy to deal with and happy to see him. Taking a phone call here, hence the broken neck look. 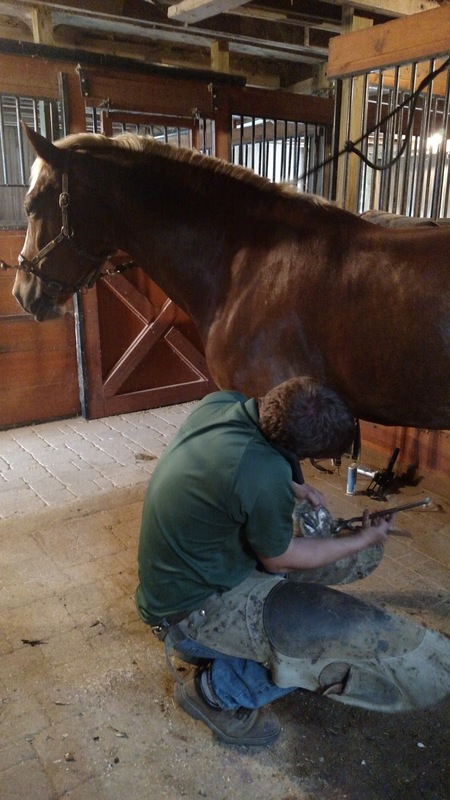 Note to self for the future: When you move barns, maybe try to find out the new barn's farrier schedule ahead of time so he can get sync'ed up before he moves. As it was, Connor was due and the new farrier had just come the week before we got there, so I was scrambling trying to figure out how to get him done. 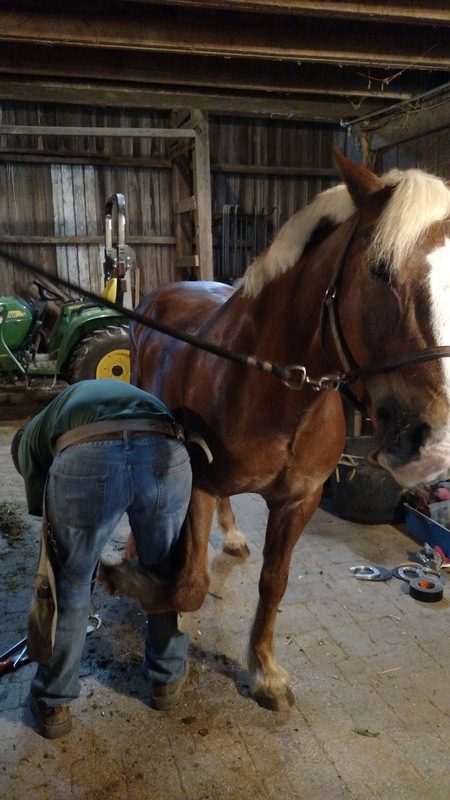 My farrier is my age, and I would say is a drinking buddy of mine and my husbands, but I had actually never seen him do my horse before. I had never seen anyone do Connor's feet before. He always comes out while I'm at work, and he always does a great job, so I've never felt like I needed to. Side note: I've also apparently never even discussed foot things on the blog before, since I just discovered I've never used "farrier" or "trim" as post tags before. This horse is so low maintenance it's amazing. I wonder what was going through Connor's head, coming back to the place that he lived for five years for a couple of hours after being somewhere new for a week. Luckily, he didn't stop to think about this existential crisis too much, and he hopped right onto the trailer for me without a second person to swing the divider over both times I loaded him. Maybe he likes the new basketball-shaped haynet I bought him. Maybe he just learned he's never going to get out of getting onto this trailer so he may as well be a good boy. Either way, I'm happy he's loading as easily onto this one as the six horse. It is always so interesting reading how Connor handles situations to compare to Ffergie. Yeah for a good lesson, farrier visit, and trailering! Is it similar? While I can't say I like it, I really don't mind this behavior when we go somewhere new, because at the root of it is an intense self-preservation instinct, which is also the reason he's never been injured. 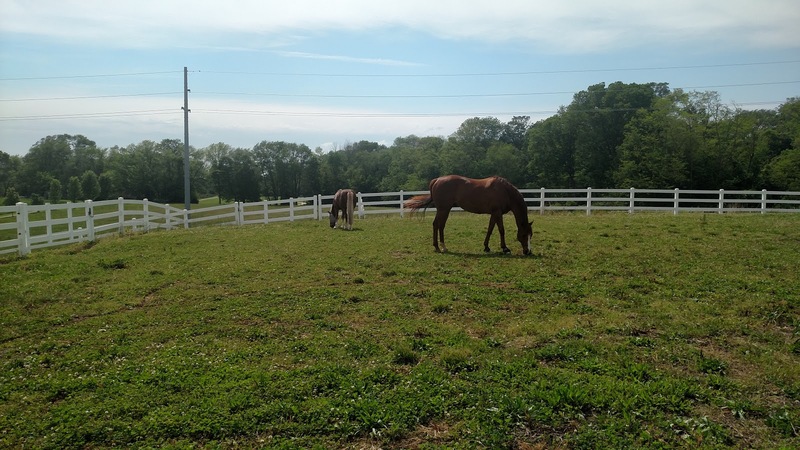 Can't have one without the other, and I know he'll settle down and be my normal pony eventually, it will just take time. Is that Zach?! lol he is hilarious and ornery. Lol, yes, that is exactly how I would describe him! Sometime I should tell you the story of me and Nick, him, CJF, and a pile of other people sharing a house in Florida for a week for my trainer's wedding. Much alcohol was consumed, many shenanigans occurred. Exactly. 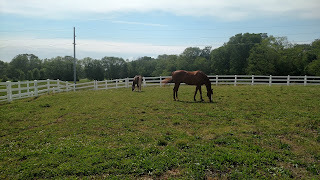 They are not bargain basement cheap to buy, but if I added up what I've saved in farrier, vet and feed bills by having a horse that doesn't need shoes, never gets injured and eats almost nothing, I bet I'd come out ahead. Aww he'll figure it out! Glad you were able to get a lesson in at the old place. It's a big change for him. :-) I'm sure he'll be fine soon. He is so very adorable looking in the trailer.